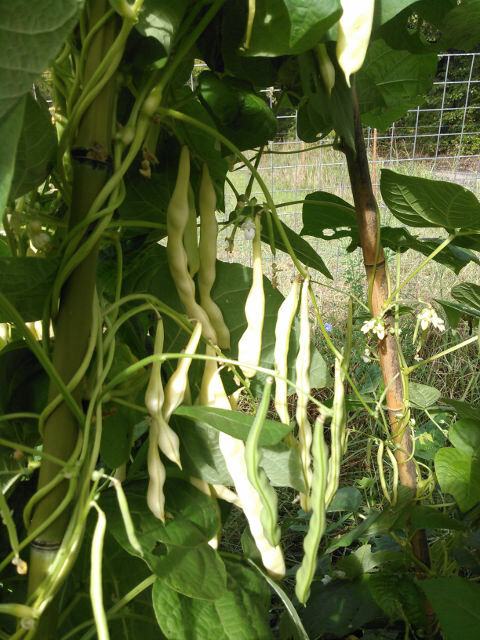 Barksdale Wax Pole Bean is one of the garden varieties which taught me the most about seed saving. It was the spring of 1984. I was 25 years old and in my second gardening season in Winona Lake, Indiana, where I was attending seminary. Jerreth and I had been married for three years. The year before I had grown out Tomato Rocky, an heirloom inherited from our dear friend Rocky Mastro, through my father. I was excited about old garden varieties and most likely, I spoke of this with Jerreth's grandparents. Albert and Cora Swalley. “Grandma and Grandpa Swalley”, as I knew them, were amazing people and Grandpa was perhaps the closest thing I ever experienced to having a grandfather. They lived in Salem, Illinois; which, though a good jaunt from us, was doable for occasional visits. While visiting, they gave me a start of a yellow podded pole bean which they had grown the previous year. They had obtained the seed from Claude Barksdale, who had lived as a neighbor to them when they still lived and worked the family homestead, outside of Salem. I remember Grandma telling us of her memories of the large patch of these beans which Claude and his family would grow every year. Claude's family got the seed from their own aunt, Lavera Halsclaw when she was 101 years old and had grown it, herself, for 40 or 50 years. I do not know how long the Barksdales had the bean after obtaining seed from Lavera Halsclaw. But I suppose it had to have been at least 20 years, for that is how long it had been since Grandma and Grandpa Swalley had lived in town. My wife and I have never met anyone from the Barksdale family. And we have never heard anything about this bean, directly from them. Barksdale's pods show very slight signs of having strings. But I have never managed to pull a string from one of its pods. They're too fragile. Still, I consider Barksdale Wax Pole Bean to be a true string bean, in that the pods are truly tender until they start to get dry. This is, by far, the most tender podded bean I have ever tried. Without exception, everywhere I have grown this bean, and managed to harvest, it has waited until cooler fall temperatures to start any significant production. 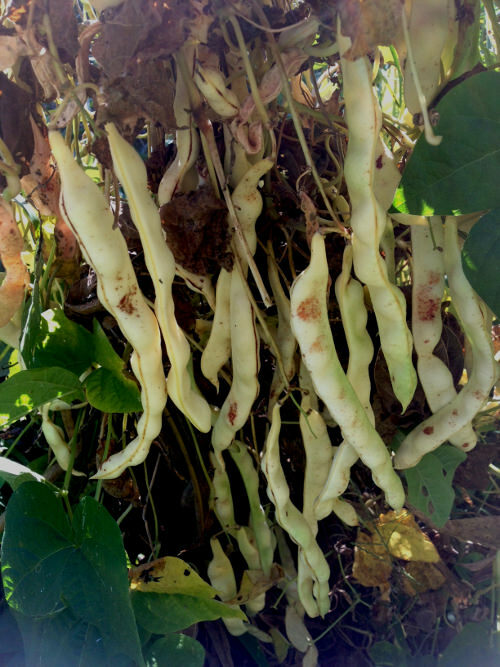 Some years ago an Appalachian gardener suggested that Barksdale Wax Pole might be an Appalachian bean, which he knew as Yellow Podded Fall Bean. Unfortunately I was unable to maintain contact with the fellow. I've grown this bean in Winona Lake, Indiana (1984, 1985), Colts Neck, NJ (1986), Jackson, NJ (2002, 2003, 2004), Edinburg (1987), Texas, Tlatlauquitepec (1989), Puebla (Mexico), Los Remedios, Tasquillo, Hidalgo (Mexico) (probably 1999-2000) and Tahlequah, Oklahoma. Tlatlauquitepec would have been the most interesting test, as it is in a high cool rain forest environment. However, that was during our first term of missionary service in Mexico, and the extreme high humidity of that region ruined almost all of my seeds, even though I had them stored in glass containers. I planted Barksdale and it was covered in pods. But a spry old Aztex campesino yanked up my entire planting and ran off with the entire thing, vines, roots, pods and all. I had no other seed, from which to replant, and, indeed, those first five years were so strenuous, I couldn't stop to think about it. Tlatlauquitepec had cool nights and days (mostly). I suspect this bean would have produced much more dependably there, than anywhere else I ever grew it. I lost our seed in 1989, while living in Tlatlauquitepec. In 1999 I requested some seed from SSE member Mike Deyo, of Killbuck, Ohio. I don't have record whether I had supplied his start of this variety, or if he had obtained it from someone else. But I grew it out in Los Remedios, Tasquillo, Hidalgo, Mexico, in 1999. Los Remedios (or Tasquillo, as we called the place) is about 100 miles North of Mexico City in the Bajío, the central plateau, which descends from Mexico City towards the North. All in all, we were without this seed for over ten years! It was wonderful to be able to obtain a new sample of the seed! Lesson learned: Always share seed with other seed savers. Never hold a variety alone, without others who also maintain it! There are times that life so turbulent that precious varieties can be lost. Share! In 1996 our family traveled from Hidalgo Mexico to minister, for a year, in the United States. During that time we made Lincroft, NJ our home base. On our way to NJ we stopped in on Grandma and Grandpa Swalley, who were in their 80s.. I asked about their Barksdale Wax Pole Beans. I was shocked to find that they hadn't grown them in years. In 1985 I had given them a sample of Georgia Long Cowpea. They found it so trouble free to grow, that they stopped growing Barksdale! Also, both Grandma and Grandpa Swalley were feeling frail. While we were in their driveway Grandpa handed me a Metamucil bottle of Georgia Long seed. As he handed it to me he commented, “Here George, keep this going. We're getting too old to garden.” They had forgotten that it was I who had given them the seed. Lesson learned: When swapping seeds, be aware that one variety may supplant another. Your original source might not grow their variety, especially if you have given them something else to try. Therefore, always be sure that new acquisitions are placed into multiple homes, where they will be maintained. 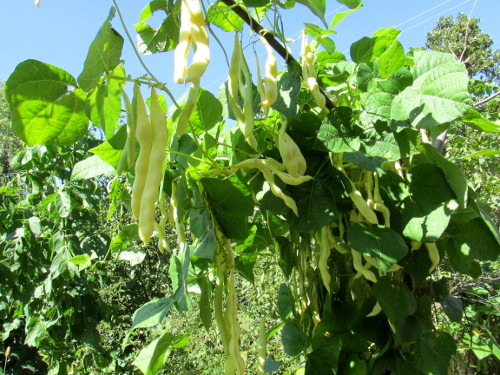 As an interesting note: I requested seed of Barksdale Wax Pole, from SSE member Mike Deyo, of Killbuck, Ohio, in 1999 and grew it in Tasquillo, Hidalgo that year and in 2000. During our years in the Tasquillo area I trialed a number of beans, both from the United States and from Mexico itself. 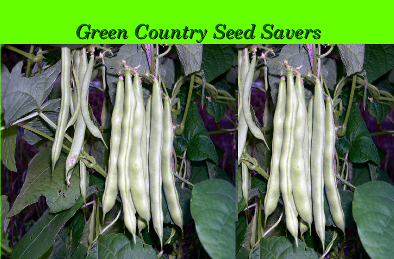 Many beans behave quite differently in their growth habit, depending on latitude. 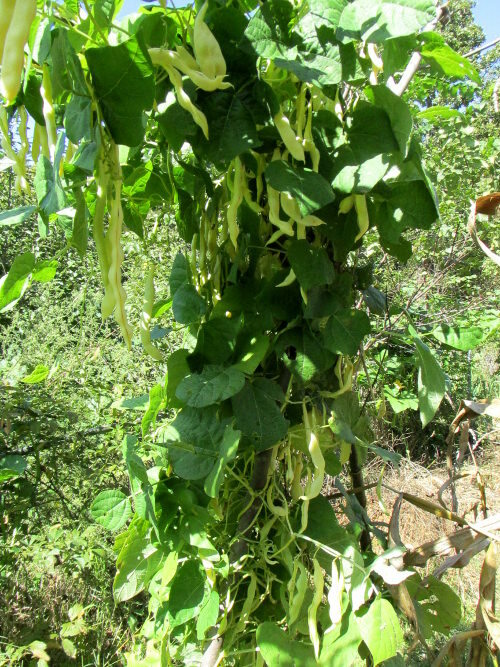 For instance, Tarahumara Pink Green Bean grows only to moderate height in the Tasquillo area. But anywhere North of there, where I have grown it, the variety is amazingly indeterminate, breaking poles and taking over adjacent plantings. Barksdale appears to be day length neutral. Its vines have essentially the same vigor at 20 degrees latitude as they do at 43 degrees. In all the years that we've grown Barksdale Wax Pole, we have never observed a cross. True, we have been careful to try and plant at least 15' of them at a time, and we have been careful to give at least 15-20' of isolation distance from other varieties. Many times, I've planted my beans in blocks, to reduce exposure to possible crossing. But I have encountered crosses of other beans. I remember in 2009, when I put in a couple of poles of Ma Williams (Goose)Bean. I had crosses of this bean all over the garden, but not a single cross with Barksdale. I suspect that this bean is pretty resistant to crossing. It is also quite uniform. I have never observed a plant which stood out as unique from any other of this variety. This variety seems to have somewhat lower germination than most others. It also has a higher percentage of under developed seed, when the pods are dried down. 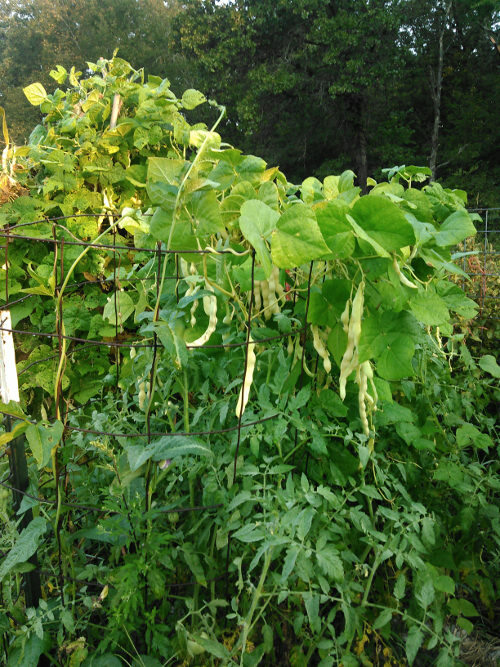 This is a picture of part of a tripod of Barksdale Wax Pole Beans which have been left unpicked, for seed, October 2015. Hi George, after lurking for some time I had to join this forum just to give a comment on this bean. I have been growing Barksdale here on Vancouver Island in B.C. every year since you sent me seed in 2009. This is the bean that turned me on to wax beans, which had never been a favorite of mine in the past, that is until now . Barksdale grown in my garden has a creamy, velvet like texture with a buttery taste and I have yet to grow another wax bean that I like better. We had quite a few meals, plus a goodly amount of seed from one pole. We had a very unusual summer here, whereas our summers are usually quite comfortable mostly in the 70's, maybe a few days in the 80's.....this year it was in the 90's for days on end, no rain and for the first time in my gardening lifetime (I've been around for a long time) we were put on severe water restrictions. I did a lot of whining as I'd do the mad dash out to get things watered in the short time allowed to do so, having a condition where I have to stay out of the sun didn't help LOL. This didn't seem to bother Barksdale in the least, they carried on flowering and producing beans while other varieties just sat and sulked until it cooled down in August. I only had the one pole but it was loaded with pods from top to bottom. The pole has been pulled and it's the best seed I've ever collected, all pods were crispy dry on the pole when picked the beginning of September, I don't think there was a wrinkled seed in the lot, other years I've had a few due to having to pick before completely dry. 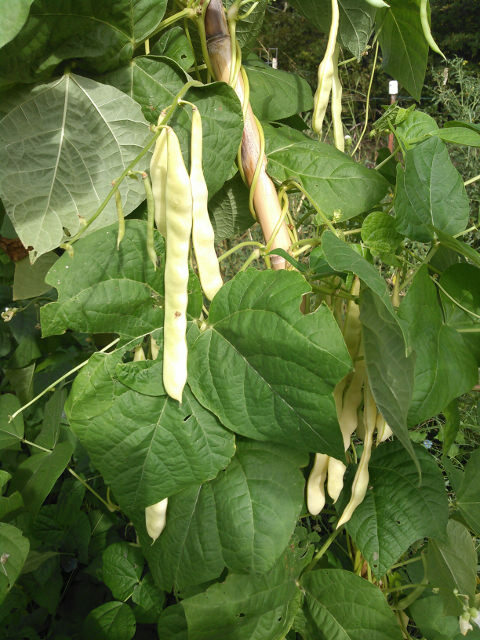 This is the one variety I will grow every year, you know what a beanaholic I am, always seeing another bean I just have to try, my list changes from year to year but Barksdale will always be on it. Thanks again to introducing me to this wonderful variety. Thank you for the observations from Vancouver Island, such a very different climate than mine! Here in Oklahoma I have to depend on varieties which are even more heat resistant than Barksdale. By "depend upon" I mean that I have count on them for a prolific harvest. Sometimes Barksdale doesn't survive here, long enough, to make its abundant fall harvest. I've seen blister beetles and grasshoppers everywhere I've ever gardened. But here we have them to the power of ten. Whereas I spotted blister beetles in other regions (and wondered what is that beetle? ), here they come in SWARMS. If they hit while I'm at work they can completely kill a planting of beans or a couple of tomato plants before I can get home and discover that there is a problem. Grasshoppers can be so severe that they will kill all pole beans within a couple of days. I've heard reports of grasshoppers eating the plastic screens right out of windows! Also, our heat and drought can be epic. In 2011 I had a penned goat knock over his water bucket and by evening, when I did chores and discovered it, the bucket had started to melt! So extra heat resistance and some resistance to drought is really necessary for a bean upon which my larder depends. Still, I try to grow Barksdale every year. It is good. And when it makes, it REALLY makes! 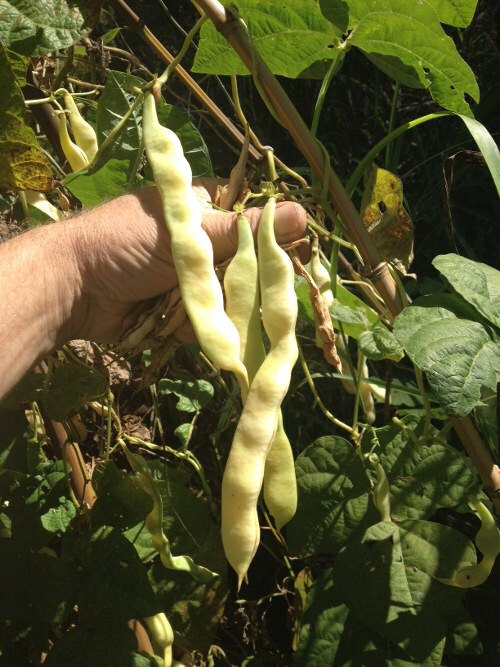 The large size and bright color of the pods make it so very easy to pick. And, since our children were small, we've planted, harvested and eaten these, remembering (and talking about) Grandma & Grandpa Swalley. They are now our family tradition. I wish more folk would come to have such a family tradition, especially if they would adopt a garden variety which is rare and likely to remain that way. Too often I see gardeners run after the latest fad and abandon good varieties or "synonyms," meaning heirlooms which appear to be the same (but might not be exactly the same) as some better known variety. A family might have preserved something for generations, only to have their seed abandoned! Okay, here's one more picture of Barksdale. An amazing story for an amazing bean! Thank you for sharing it with us! Back in February of this year Jerreth (my wife) and I drove up to Calamus, IA to drop off a flock of Buckeye chickens with Glenn and Linda Drowns, who own and operate Sandhill Preservation Center Seed Company and Hatchery. It was a long long drive but quite memorable. First of all, Jerreth and I don’t leave the homestead that often, least of all to drive a long ways. Secondly, though friends with the Drowns for decades, we have only had one other face to face visit with them, back in the 90s. Finally, it was memorable because of the winter storm which hit, while we were driving back! Our F250 only has a plain Jane differential and two wheel drive. It is not a good vehicle for icy conditions. Though we haven’t seen each other much, Glenn and I are very good friends. Many is the time we have talked, each standing in his garden, comparing notes and sharing news about the family. When we arrived at their home in February, it was interesting to me that Glenn and I were basically dressed and equipped the same way, due to our similar life styles. Boots, Carhartt jackets, caps and headlamps testified to the fact that we both do a lot of outdoor work, in the elements, and when it’s dark. Linda had prepared a wonderful meal for us, which we enjoyed over great conversation. In fact, we chatted for hours! Glenn also showed us some of their facilities and also took me to see their seed freezers. He had asked me if there was anything I was looking for. Besides one or two other things, I told him that I wanted to get a packet of Barksdale Wax Pole Bean. In 2016 he had grown a packet of seed from the late Tom Knoche’s frozen seed bank. Glenn had inherited Tom’s seeds and among other things, selected a packet of 1985 Barksdale Wax Pole Bean seed to plant in 2016. During one of our garden conversations, in 2017, he had commented about how well Barksdale was doing for him, and was surprised to learn that I was the original source. I had sent that packet to Tom Knoche, in 1985, from the first or second seed crop I grew out, from the seed Jerreth’s grandparents had given us! I wanted to grow this seed, as it would let me compare how the original stock and stock which has been grown and preserved for over 30 years compare. I planted from both seed stocks on July 22. Barksdale doesn’t set pods well in our hot Oklahoma summers, and I figured, if I planted that late, it would come into production with the cooler nights of late summer and early fall. I put in a tripod of seed from Sandhill Preservation and a tripod of my own seed. Then I planted a number of single poles, each with one or the other. The beans grew very well, though, around the first week of September a couple of our goats managed to get into the garden and give these beans a severe haircut. Fortunately, the beans survived and recovered well. We got our first snap beans on September 9, 51 days from seed, though they weren’t ready for a really good picking for another week or two. So how do the two seed stocks compare? Well, they’re almost completely identical, with just one exception. One single plant from the Sandhill Preservation Center seed stock produced a green podded plant. That plant is intertwined with all the others on the tripod with Sandhill Preservation Seed, the tripod I intended to save for seed. I will change plans and save from some of the poles. But, I will probably let a couple of the green pods produce some seed. I’m curious about this bean. I vaguely remember, perhaps, having such an off color bean crop up on the first planting I did of Barksdale, back in Warsaw, Indiana, in 1984. Perhaps that’s where this one came from. I picked and ate a couple of the pods and found them be of exceptional quality and lightly stringed. They are a tender podded bean, which is always good, in my book. But for preservation purposes, I will avoid saving seed from that tripod and be diligent in roguing out any green podded plants which should appear over the next couple of years. Here’s a picture of some of the green pods. See them near the bottom? At any rate I am glad to widen my gene pool. I’m also delighted, as Glenn put me onto something when he told me last year, that Barksdale was producing loads of pods, and that he had planted them late. A light went on in my head and I thought, “I need to try planting late!” It worked. This opens up possibilities with a couple other superior varieties which don’t like to set pods in our heat. One of them Cherokee Striped Cornhill, a pole bean I received years ago from Tony West of the Appalachian Heirloom Plant Farm. That was one of the very best beans I’ve ever tried. I planted it late because I received the seed late in the season. Then, I planted a whole lot of it, early, the next year or two, and had very little production. Now I am pretty sure I know how to enjoy this great bean!